Full disclosure: I've yet to hear a DPA mic that doesn't sound great. OK, there. I've said it. Now we can get on with the review. A few weeks ago, DPA sent me a box full of mics. And there are few things that make me as happy as getting a box of mics. The box contained four 4088H Hanging Choir Mics (initially reviewed here), two 4099G Guitar Mics and a SMK 4081 Stereo Mic Kit. The 4081 contains two mics, two clip mounts, two magnet mounts and two XLR adapters. Between the clips and the magnet mounts, there are a wide variety of options for positioning the mics. The mics attach to the clips or magnets by way of a ball and socket joint, so it's easy to position them just the way you want. About the only criticism I have of the mounting system is that the ball is right on the mic, so you can't tip it too far in any direction. Not a deal breaker, but putting a slight stand-off on them would aid in positioning. My purpose for testing these mics was for use in a closed-lid piano. I've tried to mic pianos will all sorts of mics over the years, and in a live setting, it's near impossible to get the right balance of good sound and isolation from everything else on stage. 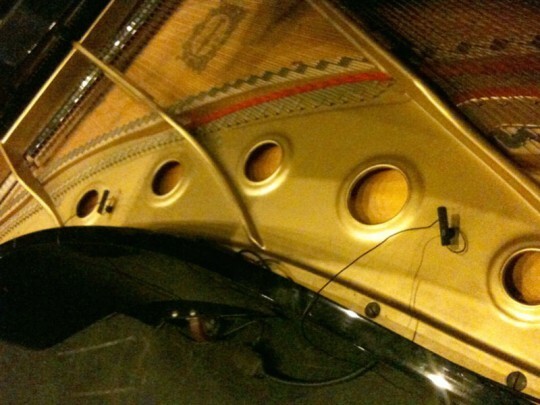 We're currently using a pair of Beta 91s inside the piano, and while they sound OK, they pick up everything else on stage. On my first day of testing with the 4081s, I found the same to be true, they picked up a lot of drums and bass (the piano sits next to the drum set). Isolation was still a problem, and I didn't feel I could make a reasonable judgement of the sound quality under those conditions. 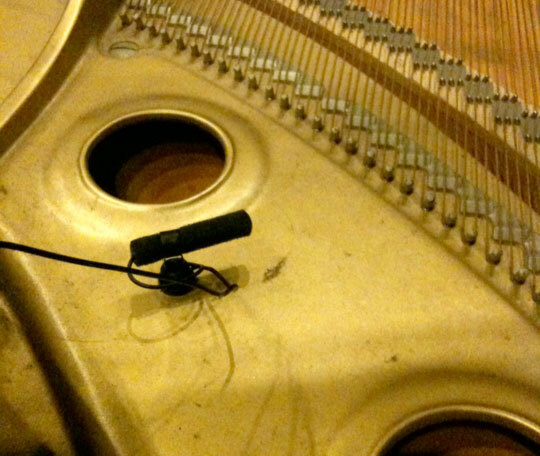 Both mics in the piano. A clearer picture of the clever, magnetic mounting system. Very low profile.To try to establish a more reasonable test, I asked Luke Peach, our resident Student Ministries Worship Leader, to play our Yamaha C7 Midi Piano for me, while I recorded. Since I just picked up an 8-channel M-Audio Fast Track Ultra, I was able to multi-track the Beta 91s, the 4081s and the new Muse Receptor running Ivory all at the same time. The results were somewhat surprising, which is to say, they all sounded acceptable. I really expected the 91s to sound lousy, and they didn't. I also wondered if Ivory would sound as good as the mics; and it's quite close. So here's what I did. I recorded all the tracks in Reaper and mixed them up a little. This first audio file contains three roughly 30 second clips. It's the same piece played back three times by the three sources: First DPA, next Beta 91, finally Receptor. The song clearly ends, so you'll know exactly when the next mic starts. For this sample, all mics are totally flat with no EQ or processing of any kind. I matched the levels when I recorded and played it straight back. This is a 192 Kbps, 48KHz Stereo MP3 (I rendered wav files, but they're 30 Megs and didn't sound better enough to justify the 28 meg download hit. You'll need decent headphones or speakers to really judge the quality. The bold Receptor has the above-shown EQ applied to it, the other two are flat. Take a listen. Since it might be hard to keep track of which is which, I did a screen capture of the playback so you can watch it change sources. 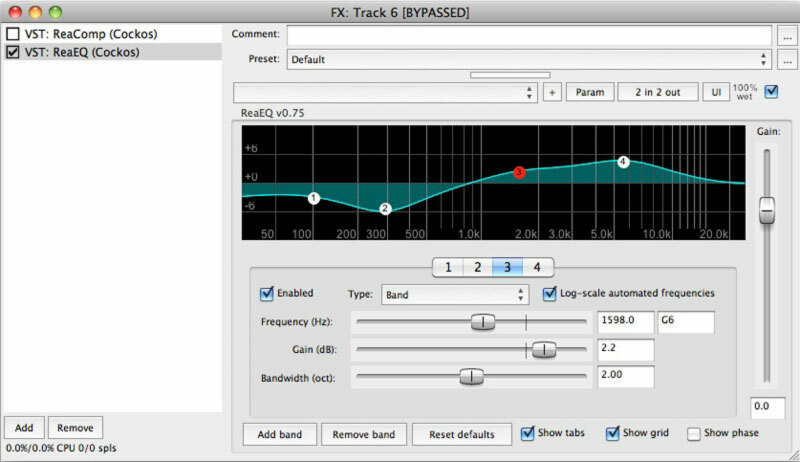 If you watch the FX enable on the Receptor tracks, you can see when the EQ is applied (FX is green) and when it's not (FX is red). The DPA mics sound really, really good. Compared to the 91s, I think they sound a bit more natural and open, with less low end resonance. That could be partially due to the positioning of 91s, but I think a big part is the sound of the DPAs. I didn't have a ton of time to play with positioning of the DPAs, I put them where Bruce Myers of DPA suggested. With more experimentation, they could potentially sound even better. On the other hand, they sound pretty good just being dropped on the soundboard, so I think we have a winner here. Pricing for the set will be $1,128 retail for the set and should be available by the end of June. Also, I heard from Bruce that the 4088HB Choir Mic will retail for $499 for the mic and XLR adapter. Three lengths of cables to go in between will be available for a nominal additional cost. Those are also expected by the end of June.